The picture below on the left is a Ponderosa Pine milled timber. Note how few and small the knots are, and the lack of bark on the edges of the beam. We get a better milled timber because we start with a better sawlog. 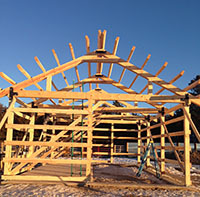 Our milled timbers come from the centers of very large, slow-growing trees. Each milled timber is carefully cut to the precise dimensions you order, and is 100% free of defects like rot, insect damage, bark seams, and handling damage. Zoom This wood beam portico was built with a ridge milled timber, ceiling beams, and support beams made from Eastern Redcedar. For lengths between 16 and 24 feet add $0.50 to the dimension price. For lengths greater than 24 feet, call for pricing. Zoom We start with high-grade logs, which results in straight timbers, free of defect. 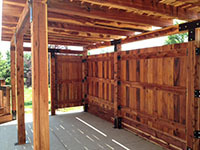 Zoom Our eastern red cedar has a naturally deep red color, and beats other cedars and redwood for rot-resistance.